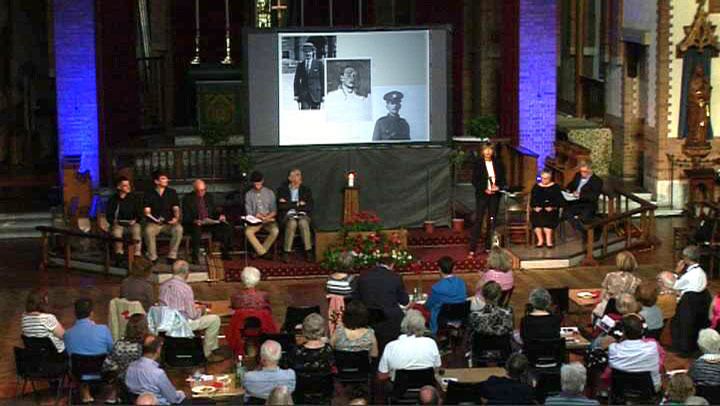 On August 4th, as part of its programme of events marking the centenary of the start of WW1, St Barnabas Church held an evening of moving tributes in the form of diary readings with slides, films and ending with a live link up to the commemorative service being held at Westminster Abbey. The mood was carried over into the meals being served – delicious Trench stew and Bully Beef. A showing of the classic film ‘All Quiet on the Western Front’ was preceded by diary readings of three local men who went to fight: John Noppen, Jack Martin and Julian Gould. Noppen was a professional soldier whose diaries were discovered and transcribed by Pat Baxendale who lives next door to Noppen’s former home in Brentham. Jack Martin was great uncle of Brentham resident Martin Mortimore and Julian Gould was a young artist who lived in Woodfield Avenue, the son of Frederick Gould, the moral philosopher. Of the three, it was Julian who never came back from the war. He died in action aged 26. The Noppen diaries and a biography of Julian Gould are in the archive section of this site. The writings and drawings of these men are a moving record of life at the front line whether describing the heat of battle or the scourge of sleeping with rats. The venture started out last year as an evening in the Pitshanger Bookshop arranged by Sue Elliott and Pat. Later, together with Martin, they adapted it for Year 9 students at Brentside High School, with a slide show to illustrate the readings. The artwork that resulted was on display in St Barnabas for the August 4th event. It really was the most extraordinary evening, especially right at the end when the lamp on the Tomb of the Unknown Warriar was extinguised in the Westminster Abbey service, the church went dark except for a single candle, then that went out and the church was in complete darkness for a minute or two. You could have heard a pin drop in the silence (except for the rumble of the E2 outside!) Then to come out into the night, see the wonderfully restored war memorial beautifully lit and also the ‘Beam of Light’ in the centre of London in the distance to the East. Memorable. I felt priviledged to have been a small part of it. Thanks for the link to your archive of John Noppen’s diary. Now I won’t get any work done for the rest of the evening. An excellent way to commemorate the centenary. Congratulations to everyone involved in this project.